Listen to BBC local radio for Bristol, Somerset, Gloucestershire, or Wiltshire. 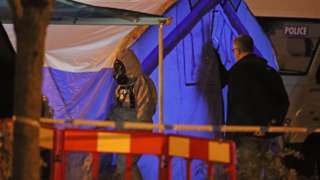 Russia is behind the attempted murder of an ex-spy and his daughter in Salisbury, the PM believes. 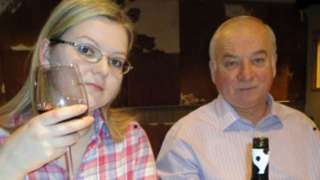 Russian spy: What happened to the Skripals? Timeline of events surrounding the poisoning of Russian spy Sergei Skripal, his daughter and a couple in Amesbury. 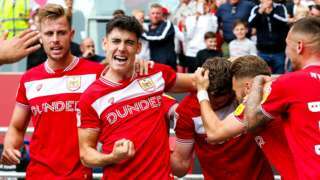 Bristol City extend their winning run to four games with victory over Sheffield United thanks to Marley Watkins' late goal. 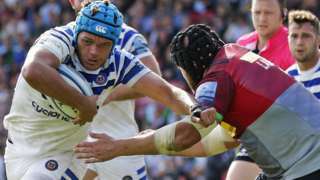 Bath register their first win of the Premiership season as they hang on for a bonus-point victory at Harlequins. 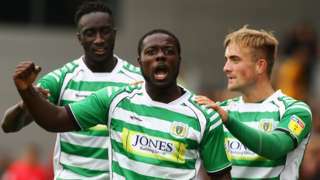 Yeovil hit Newport County for six as they extended their unbeaten run to six games with their biggest win of 2018. A midwife from Bristol has been struck off "to protect the public", the Nursing and Midwifery Council (NMC) has said. Jane Woodward was working for the North Bristol NHS Trust when she administered a painkiller to a patient in December 2012 and forged a colleague's signature to claim she had also been present. The following summer, Mrs Woodward wrote the wrong patient's name on an infusion bag and incorrectly labelled the drug and the dosage. Mrs Woodward was not represented at an NMC hearing, her fifth since she was suspended in 2014. She said in an email that she was now working as a healthcare assistant and did not intend to return to midwifery in the near future. Three play areas in Trowbridge have been vandalised - one for the second time in a week. The town council says repairs to the damaged equipment have cost £1,300 so far. Bolts and planks were removed from the play in Regents Place. The harness on a swing at Regents Place has also had to be replaced again after it was fixed last week, costing £249. The safety surface at Westfield Close play area was deliberately ripped up. The platform at Paxcroft Mead play area was forced up, creating a finger trap hazard. Several picnic benches donated by the landlord of the Kings Arms pub in Trowbridge have also had to be removed after being ripped apart. The damage has been reported to police. It is sad that the actions of a minority are jeopardising the enjoyment of the majority. If play areas are repeatedly targeted by vandals we will be forced to close them. Emergency services are trying to free a woman from her car in a crash on the M49. The road is closed going south. Damien Hirst is making 50 staff at his company Science Ltd redundant across its locations in Gloucestershire and London. The job cuts are understood to be mostly in finance and IT. A spokesman for the company said: "These changes are not driven by a need to reduce costs but by his desire to cut the corporate elements of the business to get back to a simpler way of working focusing on his art." Damien Hirst has several studios in Chalford near Stroud. Video caption: Bristol tech start-up firm pioneers growing salad in a warehouse.Bristol tech start-up firm pioneers growing salad in a warehouse. A major crash has forced the closure of the M49 southbound. Traffic is expected to be very heavy in the area as we head into the Friday evening rush hour. 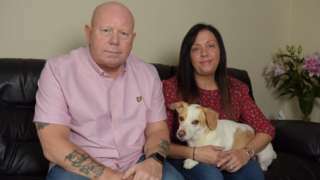 Neil Walker is urging men not to be embarrassed about having intimate problems checked out. 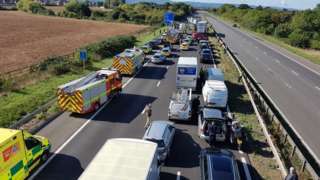 Police said a man in his 50s and a woman in her 40s died in Thursday's M5 collision. M49 Bristol southbound severe accident, between M4 J22 and M5 J18A. M49 Bristol - M49 closed and stationary traffic southbound between M4 J22 and M5 J18a, because of a serious accident. A 19th Century bridge that links Herefordshire and Gloucestershire across the River Wye will reopen later this month. Lydbrook Rail Bridge, known locally as the Black Bridge, was built in 1875 for the railway, but, when the line closed in 1964, it was turned into a walkway before shutting in 2016 due to safety concerns. An application to the Heritage Lottery Fund to repair the bridge was turned down in July. But Herefordshire Council says work to make the structure safe for people on the river below has allowed engineers to devise a safe, short-term solution to reopen a temporary walkway. 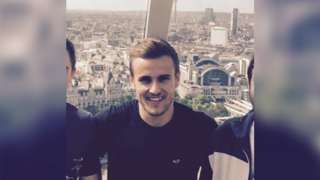 Adam Howells had to pay more than £10 to Arriva Trains Wales to have his wallet returned. A359 Somerset both ways severe accident, between The Half Moon Inn and B3148. A359 Somerset - A359 in Mudford blocked and very slow traffic in both directions between The Half Moon Inn junction and the B3148 junction, because of an accident. M5 Bristol southbound severe disruption, between J19 for A369 Martcombe Road and J20 for B3133. M5 Bristol - One lane closed and very slow traffic on M5 southbound in Somerset between J19, A369 (Portishead) and J20, B3133 (Clevedon), because of emergency repairs. 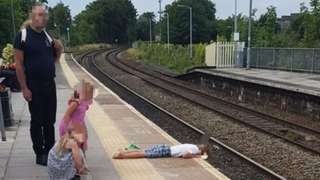 A photograph of the six-year-old boy with his head hanging over a train platform went viral. Three teenage boys have been arrested over an attack in Swindon earlier this summer, police have said. Three 18-year-old men and an 18-year-old woman were injured on Vistula Crescent after leaving the Asda at the Orbital Shopping Centre at around 01:30 on Saturday 28 July. A bike saddle was used as a weapon and one of the victims was left with a fractured eye socket, a broken nose and broken ribs. Two 16-year-old boys and a 17-year-old boy, all from Swindon, have been arrested on suspicion of assault occasioning actual bodily harm, grievous bodily harm and two counts of common assault.